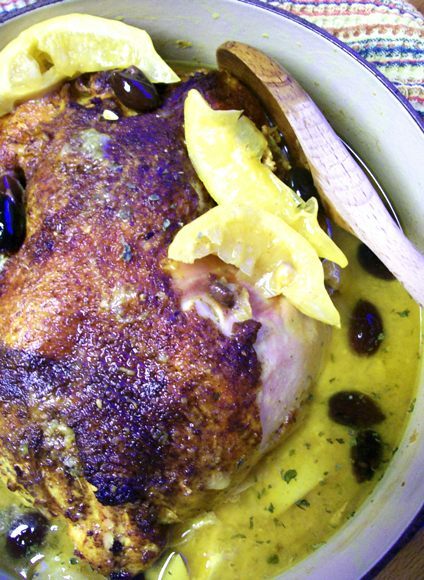 Learning to make Greek Chicken as I was growing up was kind of like a rite of passage. There was a friendly competition between all the women in my family as to who could make the best batch...to see who's version could cause the eater to take that first bite and then close their eyes blissfully. 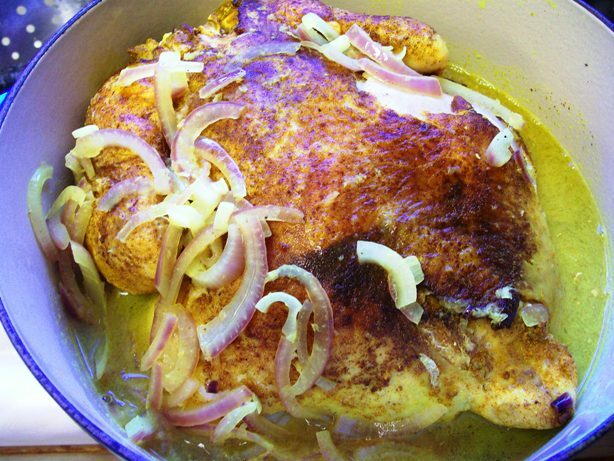 Even though we all used the same ingredients there is something intangible about what each cook does to this recipe that can make it transcend ordinary baked chicken. What truly makes me happy is that this recipe has been passed on beyond the familial boundaries and I now have friends who will call up to tell me they made this dish for their family and how well it turned out. Nothing could make me feel more proud! 1 whole cut up chicken - discard the innards. 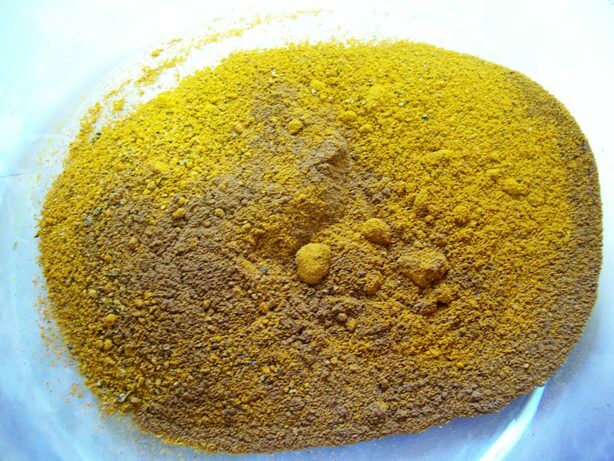 You can also use your favorite chicken pieces, but if you do be sure to use bone in chicken with the skin on. Even if you remove the skin later, trust me, it will be much better if you cook with the skin on. 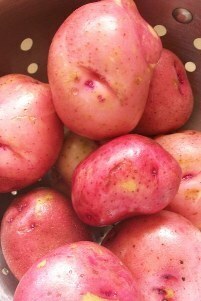 Clean potatoes and depending on the side either cut them in half or quarter them. 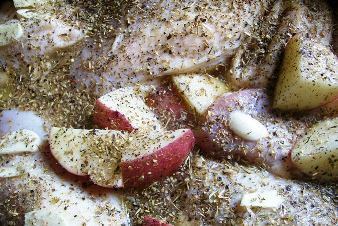 Place the chicken in a large roasting pan and scatter the cut up potatoes amongst the chicken pieces. Drizzle olive oil over the chicken and potatoes - you want to lightly coat each piece - then rub the oil in with your hands. 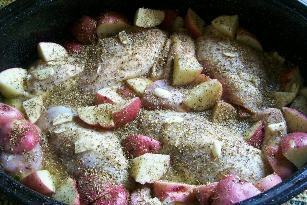 Pour the lemon juice, half the white wine and half of the can of broth over the chicken & potatoes. Scatter the garlic slices around the pan. Season all the chicken generously with salt, pepper and oregano. Don't be shy - you don't want wimpy flavors - think Greek! 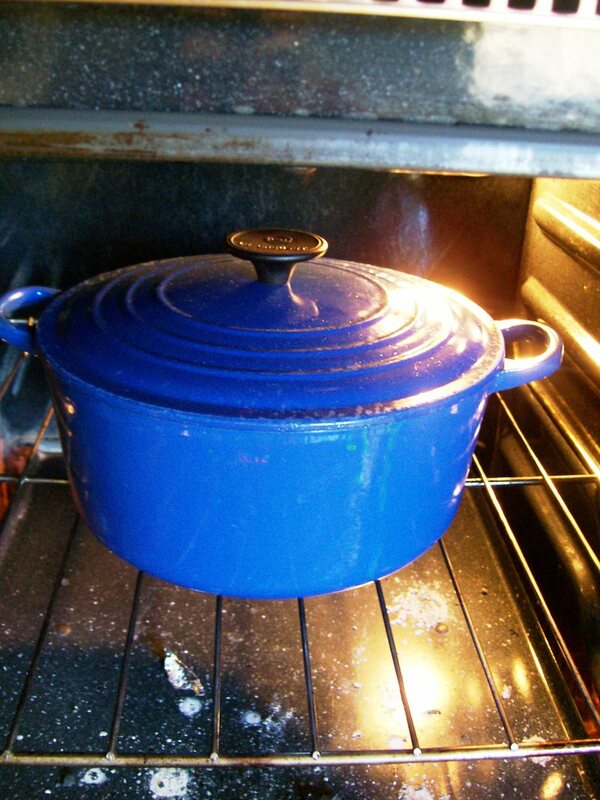 Place the pan in the oven and let it bake for 20-30 minutes until the skin starts to brown. Baste the chicken, then lower the heat to 375 degrees. Bake for another 40-60 minutes or until the chicken is cooked through, basting at least every 20 minutes - you can do it more if you like. Note: If the sauce in the bottom of your pan begins to dry out, add the remaining wine and chicken broth. If not, drink the wine and keep the chicken broth for another day. 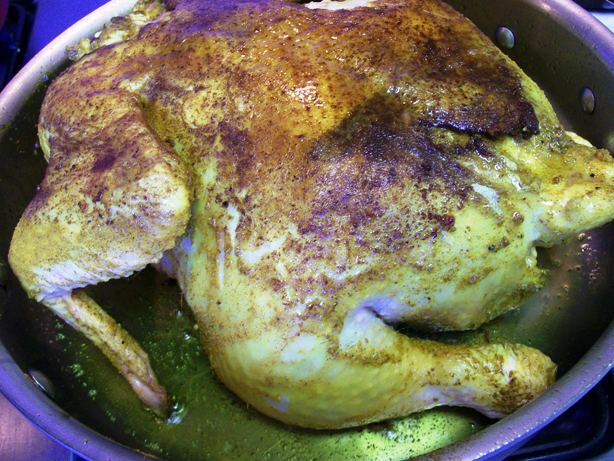 Once the chicken is done, remove it from the oven, cover the pan with foil and let it sit for 15-20 minutes. 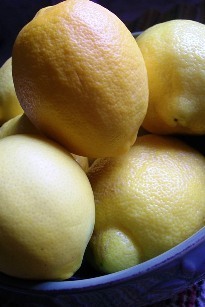 Serve with Peasant Salad or Corn Salad (I'll post those simple recipes another day) along with a nice white wine and a toasted baguette to sop up all that fabulous lemony sauce! I haven't been cooking as much as I'd like lately. It bums me out. I look around at all my favorite blogs (and the ones I wish I had time to frequent more regularly) and I see delicious things like Gingammonbread a la A Southern Grace, Fennnel and Fig salad from Bitchin Camero and even something as simple as slow roasted tomatoes from Smitten Kitchen. Gosh, it all looks so good, and I have been adding too infrequently to the fray, for my taste. 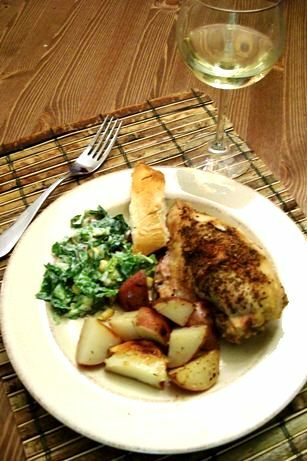 But, I got my druthers together the other night, and threw together this yummy chicken. I think I may be slightly insane for cooking a chicken in the oven when it's 90 + degrees outside, but that's what central air conditioning is for....give me a "holla" if you agree! 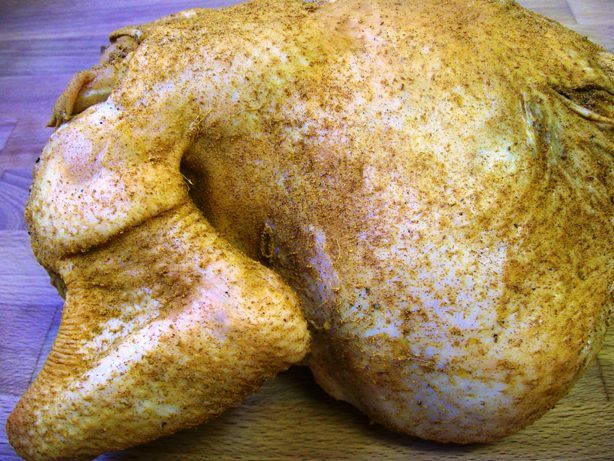 Then rub it all over the chicken, get under the skin as much as possible. 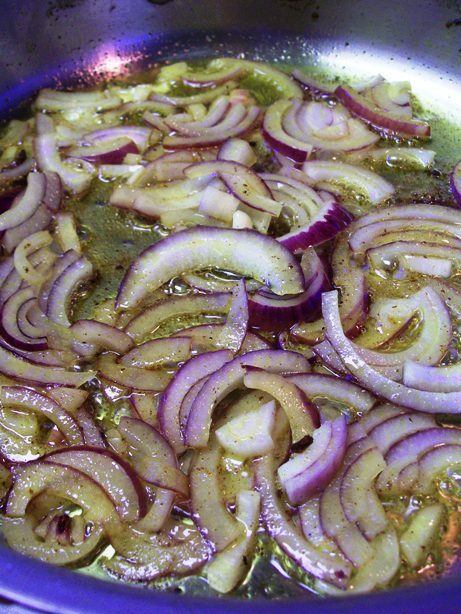 While the chicken is browning cut up one, large red onion. Then, remove said chicken, set aside and cook the onions in the rendered chicken fat. 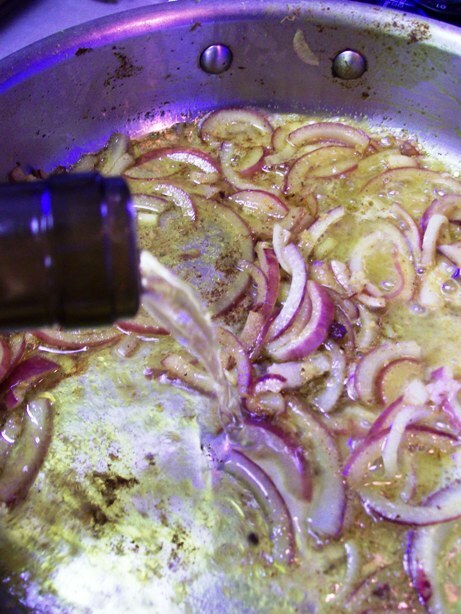 Once the onions are soft (5-10 minutes) deglaze the pan with white wine. Then add the chicken broth, honey and ginger root and combine. Make sure to scrape up all the good bits. Then pop the chicken back into the pot. Scoop some of the goodness on top of the chicken. Cover, and put it in the oven at 370 degrees for 30 minutes. Cover it back up, pop it back in the oven and continue to cook for another 45 minutes. How many of you went on a diet this summer? I can't see them, but I can feel hands raising across the world. One of my favorite food programs to follow, the Mediterranean diet, just happens to contain my favorite foods in the world. Lucky me! 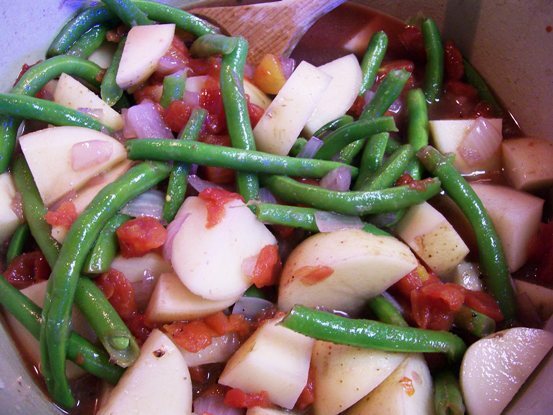 It's all about lean meats, fresh veggies, including lots of tomatoes, and good for you fats. 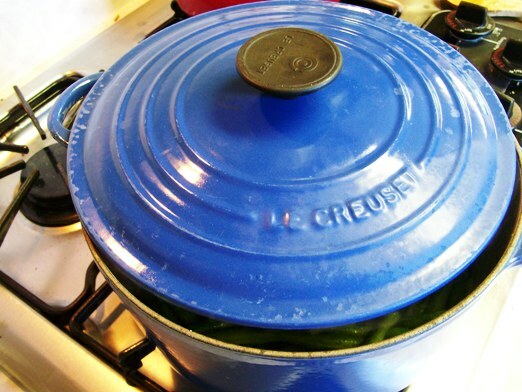 I lean toward Greek recipes which are high in flavor. 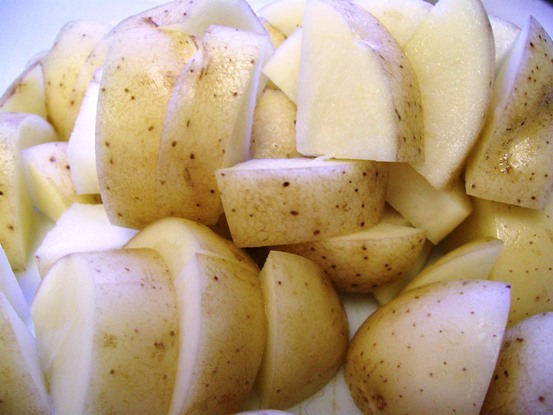 - 1 pound white potatoes - scrubbed and cute to the thickness you like, I tend to like my pieces on the bigger side, but, dealers choice! 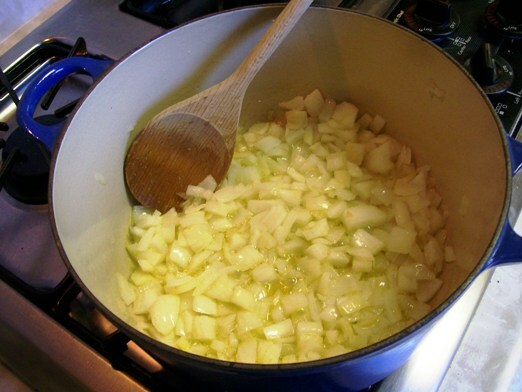 Start by cooking your onions and garlic in a generous amount of olive oil. Cook until the onions are soft, but not brown. 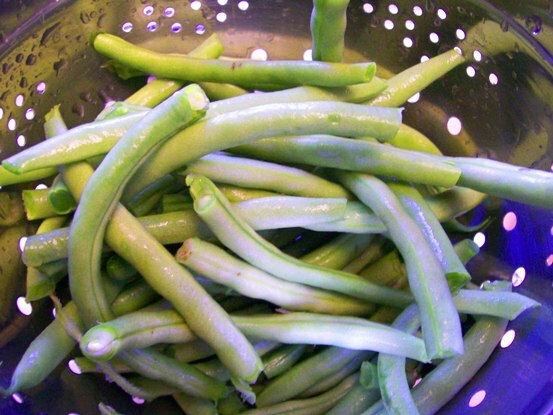 Then add your washed and trimmed green beans to the pot and give them a good toss. 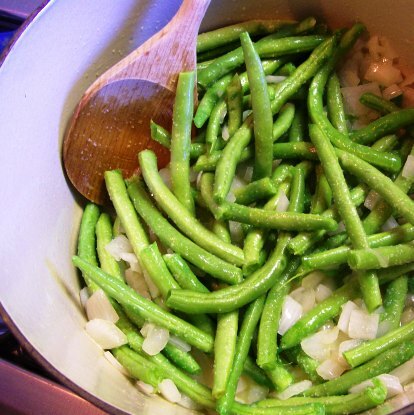 Let those cook for about 10 minutes, or until the green beens begin to get tender. Next deglaze the pan with the red wine, then add all the remaining ingredients, except the tomato paste and the butter, combine well. Let the mixture come to a boil, then reduce the heat and place a lid on the pot half way. You want some steam to escape so your sauce will thicken up. Let that cook for about an hour. Uncover the pot add the tomato paste and let the sauce continue to thicken for about 15 minutes. Finally, add the butter, combine then take the pot off the heat. Let the mixture stand until it's room temperature. Serve it as is, or, if you like, sprinkle a little feta cheese on top! 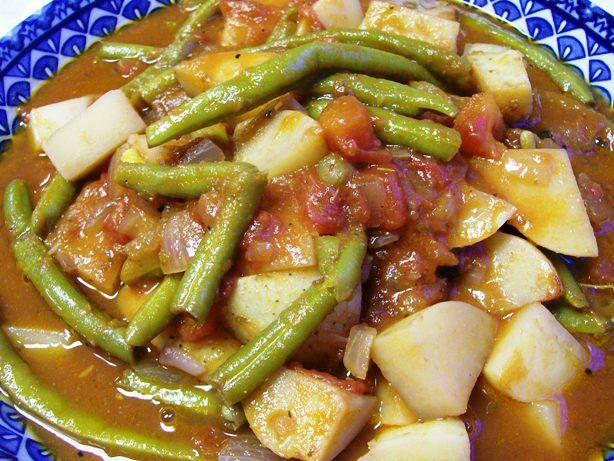 This dish is easy to make, very flavorful and good for you too! We actually enjoyed it for breakfast the next day. I tried it cold as well, and although the flavor held up, the texture wasn't my favorite. 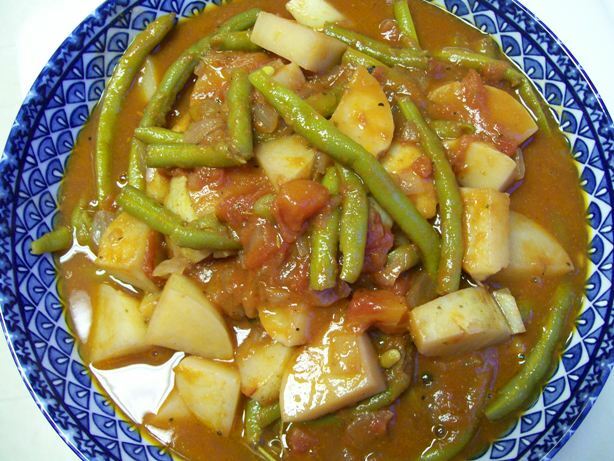 I'd make this again in the winter time and eat it piping hot with some crunch French bread and lots of butter. But while it's still swim suit weather, I think I'll stick to this version.